On the plane now (the same United Airlines 767 with an out-of-commission lavatory that I flew seven days ago going the other way across the Atlantic) headed home after a fun time in London. The two-day Science Online London conference was very enjoyable, with good sessions and demonstrations and discussions focused on data sharing and promoting open science (Michael Nielsen keynoted with a talk heavy on social research, arguing that open science needs to be a common good for it to become common; Nielsen will be at Duke Oct. 4). 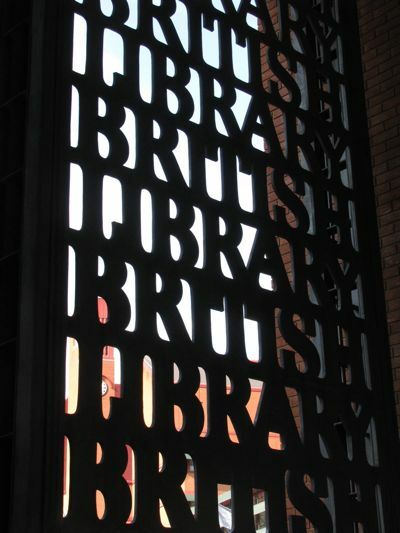 The British Library was a good, central place to hold the conference, and the weather these first few days was simply splendid — warm, sunny, perfect. On Saturday, I broke away from the conference to meet up with a handful of long-time Textpattern users, at a pub in Covent Garden. I’ve used Textpattern as the content management system for mistersugar.com since 2004, and the other guys have helped the open-source CMS stay alive. It was fun to drink a pint, share our support-forum memories, and talk about ways to make Textpattern a more popular choice for site and blog development. Both nights after the conference sessions, we ended up, naturally, in the pub, drinking English ales and talking about science, communication, journalism, social media and more. Great group! Sunday, I checked of the hotel and walked to the flat of my step-brother, Nathan. We set out then, walking through nearby Regent’s Park and into Camden. As the rain began to fall, we walked along the canal and into Camden Lock Market. We bought plates of West African food, and sat under an umbrella, talking about travel, St. Croix — we hadn’t seen each other since I lived on the island, nearly 30 years ago — and things to do in London. We split up after that, I walked to the Tube and headed to the British Museum to view the Rosetta Stone and the Parthenon marbles. Then, shopping and people watching along Regent, Oxford and Carnaby streets. Monday, cappuccino and croissant at on of the many tiny cafes in Fitzrovia, then more Underground traveling, popping out at Green Park for a quick look at Buckingham Palace — flag was up so Queen in residence; witnessed one of the guards almost slip and fall on his march to and fro, his heavy clogs apparently hitting a smooth or damp patch on the rug — then walking along Piccadilly to shop. Lunched again on food from an ethnic stall, this time Moroccan salmon tagine in the courtyard of St. James Church. A double-decker bus to Kensington South station for a visit to the Victoria & Albert Museum (just of a couple of forgettable Turners but an amazing cast of Trajan’s Column, displayed in two sections because the scale is so big) and a call upon a writer friend attending an ill spouse in the reputable Royal Marsden Hospital. There’s no secret to writing a book, he tells me. “You sit down at a keyboard, and you begin to type word after word.” He’s written numerous books himself, at least two about aeroplanes and airlines, others about travel. So that I’m sitting at flight 37,023 feet high, writing a blog entry about my trip to London, is a good sign that I’ve got it in me. Once back in North Carolina, I’ve got big projects at Duke, and ScienceOnline2012, and a narrated slideshow to commemorate 50 years of the Peace Corps through pictures of my dad’s and my own service. I’ve enjoyed this trip immensely. The freedom of singular travel is great, although at every turn I wanted Erin and Anna and Malia and Oliver to be along with me to experience the city with me.